Korean Beef Rice Bowls takes about 20 minutes to whip up, so quick and easy, loaded with flavor for under 400 calories! I came up with this Korean beef rice bowl the other night and they tasted so DANG good I knew I had to share. I used to work 2 blocks away from Koreatown when I worked full-time in Manhattan and loved having lunch with co-workers in nearby restaurants. Since then, Korean food is becoming really popular with Korean restaurants popping up everywhere. Unfortunately not as popular here in Long Island (yet) so if I don’t want to travel all the way to Manhattan I cook it myself. One essential ingredient you will need is Gochujang sauce. 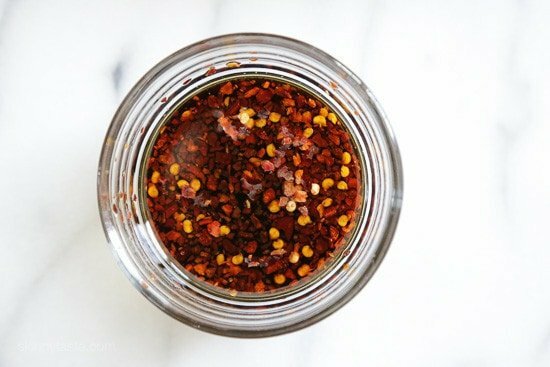 It’s a Korean condiment that’s a little spicy and sweet, and has very distinct flavor only found in Korean cuisine. It also comes in a paste which requires you to thin it down. I use Annie Chun’s Gochujang Sauce since it’s available in my local supermarket and it’s ready-to-use, or buy it on Amazon! And I’m obsessed with frozen brown rice from Trader Joe’s! It takes 3 minutes to heat up and the texture is perfect! If you live near a TJ’s, it’s a must! 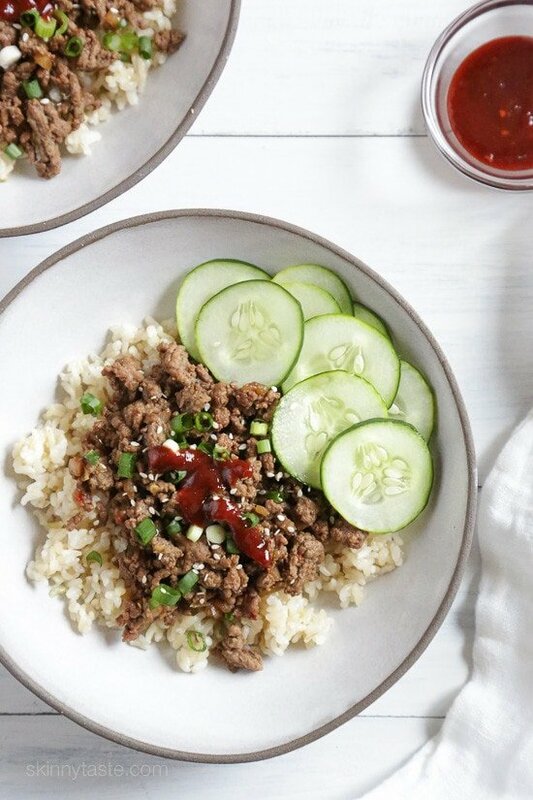 These Korean Beef Rice Bowls make a quick and easy meal, loaded with flavor for under 400 calories! Combine the soy sauce, 2 tablespoons water, brown sugar, sesame oil and red pepper flakes in a small bowl. Heat a large deep nonstick skillet over high heat, spray with oil and add the ground beef. Cook, breaking the meat up with a wooden spoon until cooked through, about 5 minutes. Add the onion, garlic and ginger and cook 1 minute. Pour the sauce over the beef, cover and simmer on low heat 10 minutes. 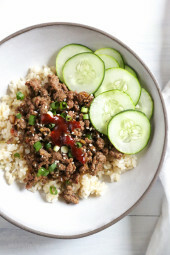 To assemble the bowls, place 3/4 cup rice in each bowl, top with scant 2/3 cup beef, cucumbers, Gochujong, sesame seeds and scallions. Love this recipe but I swear I used to have your instant pot version! Can you tell me how to convert it to IP? Thanks! Yum! This was really flavorful and easy. I love this recipe! All 3 of my boys loved it too. Thank you!! Is there any less spicy replacement for Gojujang? My kids are zero spice. Maybe hoisin sauce? This one is a winner! My husband loves it! It is so easy and comes together so fast! I’m not a huge fan of cucumber, so I just pickle them in rice vinegar with a little sugar and spices. It compliments the other flavors perfectly! This is in our regular rotation. Gina – I cook almost exclusively from your recipes, and I should really be better about leaving comments and reviews. This is one of my favorite things from you so far. The flavors are absolutely incredible. Thank you for all that you do!Tweaks I make, in case others are interested:- I chop up 8 oz. of mushrooms and cook with the beef. This enables me to get an extra serving, plus the extra veggies.- I add more red pepper flakes as I’m a spice fiend. :)- This last time I quick pickled the cucumbers, along with about 1/2 cup of matchstick carrots and some shredded cabbage I had left over. Added a whole new dimension of flavor!- When I’m eating this at home (versus lunch at work) I always top with a fried egg. Yum! Oh my…never has my husband ever reacted like this to a dish I have made…WOW WOW WOW!!!!!! This one is a keeper and I can’t wait to show off again with it! Thank you so much! So easy and so good. I used ground venison, cauliflower rice and omitted the scallions. It was so delicious!! This has become a regular meal at our house!!! My son loves it and makes it for us. Every now and then I use ground turkey and it’s really good that way too, but our favorite is with the beef. Thank you for all your recipes and thank you for putting WW points on them, it makes my meal planning so much easier!!! WOW!!!! Just made this and I can’t even believe how delicious it is. I added zoodles for some additional veggies and I made quick pickles and put them on top too. Thank you, as always, for figuring out these amazing dishes for us. Sooo good! Made this last night. But too spicy for my little kids, but used the leftover beef as lettuce wraps for lunch the next day! Will definitely make again! Hi!, This dish looks delicious! I will be trying this tonight! Ive been on the hunt looking for different dishes that i can put together. I am on a fitness journey and I am currently down 34 lbs! Ive been using 𝗵𝘁𝘁𝗽://𝗯𝗶𝘁.𝗹𝘆/𝟮𝗧𝗵𝗔𝘃𝟭𝗖 along with intermittent fasting. But when its time to eat i just dont have the desire to eat brown rice and chicken anymore. So ive been trying to switch it up surfing the web looking for recipes. I scored today! i will prepare this dish and give a update tomorrow. Thank you for the post look forward to more recipes! If I bought the gochujang in a paste, how would I go about thinning it out?? You can mix in a teaspoon of water at a time to get a preferred consistency. Wow! Tough crowd! Gina, thanks for all your hard work that you put into this free website. All your recipes are very good to excellent. And as we all know, these calorie counts and nutritional information is not an exact science. Thank you! Wow, I just can’t believe how people act so darn entitled like they are paying you for a service! Thank you Gina for all your amazing recipes!!! You are appreciated! My gochuyang sauce is rice-based, so is gluten-free. The tone of your post was very rude. Gina, thank you so much for what you are doing here. It is appreciated. My sauce is marked as gluten free. If it’s that important that you don’t have the gluten, maybe do the research before commenting your own mis-information. I’m obsessed with all of your recipes, but I think this has been my favorite! Thank you for making it possible for me to be successful on weight watchers! 12 lbs down in 6 weeks and most of the recipes I’ve made have been yours! I’m excited to try all the recipes this week but none of the SP’s are accurate. When I calculated the using the WW app almost every one of them are at least one point higher. You have to use the recipe builder as that will figure in 0 point foods. If you just plug in the nutrition the SP values will count the calories, etc of 0 point foods. This is one of my favorite meals. Its quick, easy and crazy delicious. I like to double the recipe so we have left overs. The recipe is great on top of brown basmati rice or in a lettuce wrap. Scrumptious!!! This looks so good, I’m going to try and substitute the ground beef with Morningstar ground crumbles instead since my wife is a vegetarian. We both love Korean food so I’m really excited to try this recipe. Since buying your Skinny Taste cookbook, our lives have been transformed! My wife has lost over 25 lbs thanks to Weight Watchers and your cookbook, and I have now become interested in cooking for the two of us. Thanks again Gina for all you do! Do you have a substitute for the sauce? I noticed the sauce is not gluten free. This was awesome. I doubled the sauce for the hamburger and pickled a micture of shredded cabbage and carrots with the cucumbers. I pickled them by making a sauce of rice vinegar, sesame oil, and sugar. This is fantastic. I used ground turkey as that’s what I had on hand but oh so good. I use the Gochujang Hot and Sour Sauce for my family, as they don’t like their food as spicy as I do. This is a definite add to our regular round of meals. Gina, could you possibly work up the nutrition info for just the beef so I could work it into my carb budget? Can you substitute coconut aminos for soy sauce and riced cauliflower? Really delicious! Substituted venison for the beef! Made this tonight. Husband approved! Only change I would make next time is to double the sauce mixture. I found the beef absorbed all of it and was somewhat dry. Will make again for sure. So good. My family is already talking about what to do next time we make this. We think we may quick pickle some matchstick carrots and some of the cucumber slices. We will probably use cauliflower rice next time too. I tried mine with a fried egg on top this time and it was good. But it was equally as good without. We added frozen peas and carrots to the meat this time and used venison instead of beef. LOVE this recipe. 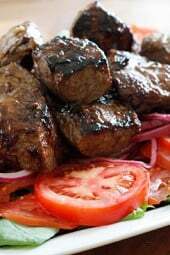 I actually used this recipe as a guide and adjusted it to my IP and the frozen beef I had on hand. Because let’s be honest, I like to cook what I’m feeling that day and what I have on hand in my freezer. For those looking to make it in the IP, I steamed my frozen beef on the trivet with 1 cup of water on HP for 6 minutes, then drained and sauteed it with the onion until it was fully broken apart. It did get a little dry during the sauteing, so I added a tablespoon or two of beef broth. Then added in the garlic and ginger until fragrant. Add in the soy sauce mixture and stir, then go for 7 minutes HP. I did increase the measurements of the sauce slightly, since I love the flavors to be more potent. I let the IP do natural release while I was working on the rice, and when that was finished, I turned the IP on sautee and let the sauce caramelize on the meat. Unfortunately, there were no leftovers for me to take this work of art as lunch to work the next day. It was that good. By far the best Korean beef recipe I’ve made. Thanks served it with sides of sauteed celery and peanuts. This was delicious!! Defiantly making this again!! I made it with ground turkey instead of beef as we are trying to be healthier. I am thinking of integrating some shredded carrots and cabbage to the meat next time. Will let you know how it turns out! This was delicious and it did not taste skinny at all !! Great combination of flavors heat, sweet, salty, and textures. I made this and my husband was happy that his craving for beef was satisfied.I knew that we aren’t a cucumber family so I pickled some shredded carrots with rice vinegar to put in the bowls, and it really added a great zing of flavor. And it was easy to do the night before! I entered this in my fitness pal and got a lot more calories for some reason?? Super yummy! I served with half jasmine rice/half cauliflower rice stir fry. mixed together. We love this recipe in our house! My 16 year old son requests it weekly and we all get a healthy meal. I add red bell pepper strips in addition to the cucumber to get more veggies in. Tried this early in the week, and it was delicious! I appreciate a good recipe that’s simple to put together after work. The Gochujang was a little spicy for me, so will cut back the next time, but this tastes good without it too. My whole family loved this!! My grocery store didn’t have the Gochujang, so I used hoisin sauce and sriracha instead, which worked well. Thanks for a great, easy recipe! Excellent dish. I made it tonight. I used 1 pound of ground beef and measure out just slightly less than 2/3 cup. It looks like I will only get 3 servings instead of four. Not sure what happened. Maybe bad measuring cup. Anyways loved it. Will make it again. I made this tonight and OH MY GOD!!!! This was so easy to make and amazingly delicious! My boyfriend loved it and we’re almost certain his 17-year old will devour the leftovers. Thank you Gina!!! This is one of our go-to favorites. It whips up quick and easy for weeknight dinners, but is also nice enough that you could serve it to guests. Plus it’s ridiculously tasty. We toss a few peanuts on ours. SO good! I think this is my new favorite!!! Was super quick to make! Served it over cauliflower rice instead of brown rice to save on some calories. Also couldn’t find Gochujan, so I mixed some sriracha and sweet and sour sauce instead. I also didn’t have fresh ginger, so I used 1/4 teaspoon ground ginger. This will definitely be in the weekly rotation!!!!!!! Doubled sauce. Added cilantro and sesame seeds at the end. Used strip steak Can’t imagine using hamburger! And good Korean sauce and sunny side up egg on top. Buddabing. After eyeing this recipe for way too long because I couldn’t find Gochujang, I finally just made it today without it, and I can’t believe I waited so long! It is SO good! This was so tasty and so quick to make! I made this planning on having leftovers the next day, and that totally didn’t happen. We ate this over cauli rice and it was perfect. I couldn’t find the Gochujang (and I didn’t have time to wait to just order it), so I mixed up sweet and sour with a bit of sriracha. Will make this again and again! I make this dish regularly for my husband and I and it is so delicious! I normally eat it over rice, but tonight I decided to try it over spaghetti noodles instead and it was so good! This was delicious. I liked it even better for lunch the next day. The flavors had settled. I will be making this again SOON!! Do you think Coconut aminos would work in place of the soy sauce. I can’t have soy? I made this last night and absolutely loved it! I did not add cucumbers to mine, but next time I am going to add broccoli or some kind of vegetable. This is so good & so easy to make! Everyone should try it. Have made this and love it. Wondering what the freestyle points would be per serving if I use lettuce rolls instead of rice. I get 6, but I’m also using 90/10 ground beef. Extra lean might even be less! I made this tonight, my husband & I quite enjoyed it. The only change I made was to slightly pickle the cucumber slices in water, rice vinegar and 1/2 tsp granulated sugar. I have also made this with gro7nd chicken greasy and Trader Joe’s Friday cauliflower rice s9 yummy and less points. I love this recipe. It’s so easy and SO good! I like to halve the brown rice and add in roasted cauli and it works so well! It’s also really good with ground turkey. I can’t beleive all the flavor that comes from the few ingredients. This recipe is a keeper! Excellent flavor for very little effort. For the cucumber, I thinly quartered and sliced it and marinated it all day with shredded carrot, sesame oil (very little), rice vinegar and sesame seeds. It gave the cucumbers a little extra kick and added flavor to the bowl. I plan to triple and freeze the beef portion of the recipe next time I make it. Thanks for the yummy and easy recipe! My husband bought me a blank favorite recipe for me to write in. I always try new recipes and forget to go back to our favorites. He asked me to write this in. Super yummy. I never have luck with grated ginger. Would powdered work? Love, love, love this recipe! My whole family is cooking it on the regular. I see that it is 5 WW points without the rice which is great if you are on that program but I am not and just keep track of macros. Do you have the breakdown of the dish minus the rice? Love this recipe! I’ve made it twice so far and it’s been a hit each time! Enjoying some leftovers right now for lunch 🙂 thanks for sharing such great recipes! This is one of my go to meal have also made it with ground chicken I also subbout 1/2 the rice for thinly shaved cabbage so good and less caloric. Made this for dinner tonight. It was very good. I am a whimp as far as spicy. Followed the instructions but didn’t have the Gochujong . Made a paste using red pepper flakes and soy sauce. Even that was too spicy for me. So I enjoyed my meal without the extra spice. Another great meal, thanks Gina!!! I made this last night, but used ground chicken instead of beef. And instead of rice I stir fried Trader Joes Cruciferous Crunch (Kale, Brussell sprouts, broccoli and cabbage). Kept everything else in the recipe exactly the same and it was delicious!! Fantastic Korean beef. Easy to make and delicious. Another awesome recipe by Gina! Thank you!! This recipe is so ridiculously easy and so delicious! My husband was skeptical at first because it seemed too simple… now it’s a regular that he asks for! He LOVES it! I think we make this at least once or twice a month! Thank you for your incredible and delicious recipes! Never disappoints! Just made it; I tripled the ginger because I love the flavor of fresh ginger. Came out perfect. I bought Annie Chung Gochujang sauce and let everyone add it on their own. Was very delicious! Thank you for this quick dinner recipe. Will be trying with vegetarian ground beef in the future for my vegetarian friends. Did you try it with ground round? I’m curious to know if it translates! I want to make this without the rice for less points. Since 3/4 cup of brown rice is 5 pts, would the freestyle points be 5 pts without rice? Will make with cauliflower rice! Yum! This is one of my favorite recipes and I just had to stop by to leave a little love! I found cauliflower rice on sale at my grocery store the last time I went, so I know what to make with it now! Korean rice bowls for dinner tonight! I made this for the first time tonight and it was absolutely delicious!!! It was my first Korean meal and it will be part of my regular menu going forward!! This was so delicious. I feel like I could make and eat it so often. My store did not have the gochujang, however, I looked up the ingredients online for the sauce and the store had a sauce with all the same ingredients, so I guessed it must be comparable! I think sauces can vary though so it’s good to test the spiciness on the sauce you use as mine was a bit fiery. I love that, but it was good to know so I left it off of my wuss kids food…. Every one of my kids devoured this as well and were racing to be the first to the leftovers the next day. 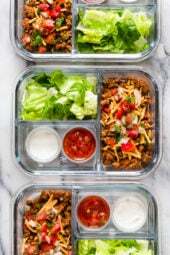 I had taken a full serving and split it into two freezer containers and had it for lunch the next two days myself. This week I plan to make it again and make extra batches just for freezing for my lunches. I’m also going to try it with turkey just to get the points/sp even lower for the lunches. Thanks for the great recipe. Hi! Can I make this in the InstaPot? If so, how long would you cook it (and on high or low pressure)? Thanks!! We make in the Instant Pot. Brown the meat using the saute function. (Use nonstick spray, or spray butter or a little oil or a little broth or water — whatever fits your diet plan.) Drain if necessary. Add onion, garlic and ginger and saute another minute. Pour mixed sauce over beef. Pressure cook on high for 5 minutes with 10 minute natural release. Release any remaining pressure. I usually co-cook my jasmine rice while pressure cooking the beef. Rinse 1 cup of Jasmine rice and put the rinsed rice and one cup water in a medium stainless steel mixing bowl (or a small cake pan), Put a tall trivet down in the pressure cooker and set the bowl with the rice on top of the trivet and then put on the lid and proceed with cooking as stated, above. After 10 minute NPR and you release remaining pressure, remove the bowl of rice and fluff with a fork. Cover the rice to keep it warm until ready to serve. I didn’t have the gochujang sauce so subbed in sriracha and added some sliced avocados on top as well to offset the spice a bit…so good!!! I absolutely love this recipe! I meal prepped it this week for my lunches. I used cauli-rice with a little brown rice mixed in. I ended up adding some mushrooms to the beef mixture that I needed to use up and it was a really delicious addition to “beef” it up a bit. I also brought some bib lettuce to make little wraps. Next time I make it at home I’ll add a fried egg becuase that sounds delicious! I thought the cucumbers sounded strange, but I really love the addition. After a spicy bite with the gochujang sauce it helps! Thank you for such an easy but delicious recipe Gina! this is the recipe that converted my husband to Skinnytaste — he asks for it often. I get the gochujang on Amazon. This is one of our family favorites! We’ve made it a LOT. It comes together so quickly and everyone likes it, which is unusual in our house! It’s a nice, easy to follow recipe. We sometimes add shredded carrots or broccoli to the meat for some extra veggies. We’ve also made with ground turkey and it’s just as good. 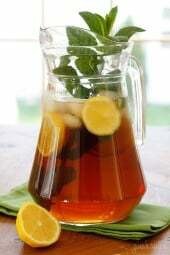 I love this recipe because it is really easy and inexpensive but still has tons of flavor! My fiancé loves it and I never end up with enough leftovers so I have to double the recipe LOL. I have made this many times and my husband and I love it. We call it “Cheater’s Bulgogi!” : o ) It’s great with a fried egg on top, which is the traditional way Korean BiBimBap is served. We mix in various veggies we have on hand, not just cucumbers. The gochujang sauce really “makes” the recipe. Thanks, Gina! Super wonderful quick meal, I also added Kimchi! Do the 10 smart points include the rice? Trying to make this with less smart points. Any tips? My guess would be cut brown sugar in half maybe even omit. This is one of my favorites! I think it does – I built the recipe in the WW recipe builder, and left off the rice, using 90/10 ground beef (that’s what I got), and it comes up as 6 pts. It’s in our weekly meal rotation!! So yummy and easy. I purchased my gochujang from Walmart and the brand is bibigogo love that sauce on more than just this dish so it is worth the purchase. 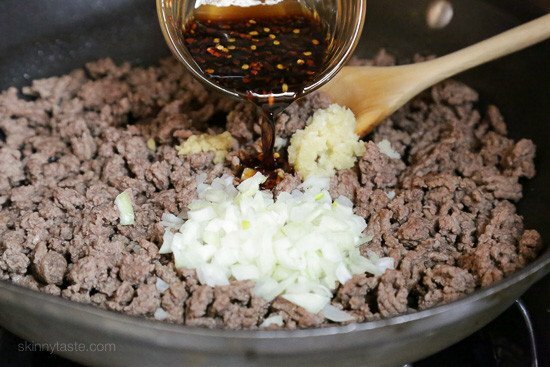 This is my go to recipe whenever I have ground beef in the fridge. It’s so fresh and light considering its ground beef. I put the beef mix in lettuce wraps with a chili paste and fresh vegetables. My husband who usually eats it with just the plain brown rice loved the recipe even more in the lettuce wraps! Loved this! I sauteed some bokchoy with Garlic instead of Cucumbers and used ground Turkey instead of Beef. My daughter didn’t like the sauce so if I make in future for anybody who hasn’t had the sauce yet, I will leave it on the side. Thank you for all of these great recipes. So yummy. This is now a family regular! I triple it so I can freeze a couple of batches to defrost/reheat for a quick weeknight dinner. We love it!